Philippine human rights advocates have emphasized,“Never Again to Martial Law!” But, current Philippine President Rodrigo Duterte’s declaration of Martial Law on the island of Mindanao defies those who experienced the horrors of the Marcos era. The international public opinion of Duterte has been mixed–some applaud his “strongman” tactics to clean up corruption in the country. Meanwhile others accuse him of being authoritarian–especially on the absent fair trial and executions of urban poor accused of being drug peddlers. The re-militarization of Mindanao does not bode well in the long history of conflict between the Philippine North, the U.S., and Mindanao. Why has Martial Law come to repeat itself in the Philippines? But most importantly, is it possible to resist this pattern of violence? The William S. Richardson School of Law Library acquired the papers of the late Professor Jon Van Dyke, an internationally renowned scholar who was known for using his legal expertise to advocate for the marginalized. Jon and his spouse, Sherry Broder, served as legal counsel on the Estate of Ferdinand Marcos Human Rights Litigation Case. The Marcos Human Rights Litigation took decades as individuals who were victims of human rights abuses under the Marcos regime, or relatives of victims, came forward seeking compensatory damages. Cases unfolded to track Marcos Estate funds being kept in international accounts. There were counter appeals to rebuke or re-direct those claims. Finally, Marcos investments in Texas properties were tapped. Some victims were compensated with those funds, although other victims were already deceased. Nevertheless, this case aimed to serve as a precedent for reparations for victims of human rights abuses under dictatorial regimes around the world. Through the support of the Hawaiʻi Council of Humanities, the Ferdinand Marcos Human Rights Litigation collection will be made accessible as a series within the Jon Van Dyke papers. 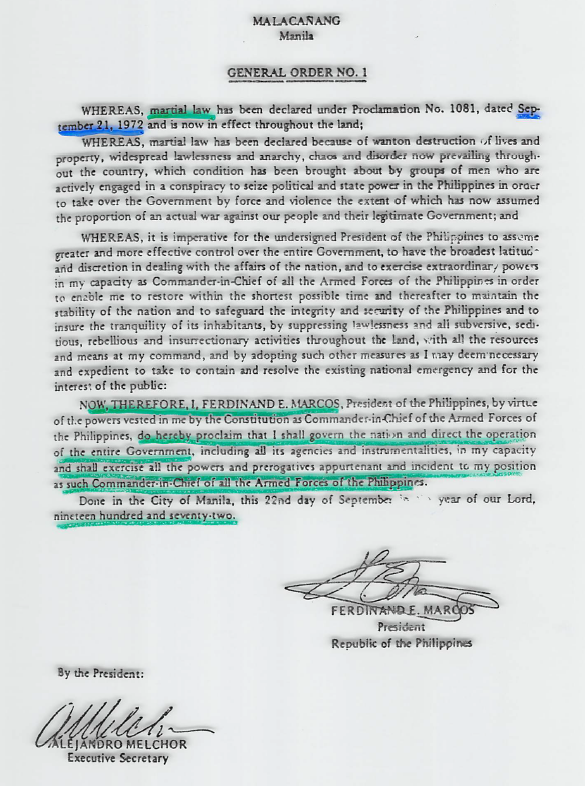 These papers are important today because the issue of Martial Law has not been rectified in the Philippines. Perhaps by understanding how Jon Van Dyke studied the issues of human rights, the will and acuity in others will awaken to address similar issues today. Here are some items that provide a glimpse of the workings of the Marcos regime since the declaration of Martial Law on September 21, 1972. But why was there chaos and disorder? The book Development Debacle explained that the Marcos administration worked with the World Bank to implement national development projects that prioritized technocratic implementation, leaving many of the poor and working populations out of the process, and thus, from the economic benefits.1 The displacement, poverty, and hunger from this development debacle led to mass civil protests, which Marcos responded to in the form of state repression. Many Filipino citizens continued to resist the abuses even after his regime was over. Although Marcos may not have been present with the police or military personnel who executed the abductions, tortures, and killings of dissidents, his position as Commander of the Security forces, as documented in this General Order No. 1, incriminated him as playing a central role in these human rights abuses. The following picture (fig. 2) is of the Main Detention Centers operating during Ferdinand Marcos Administration. 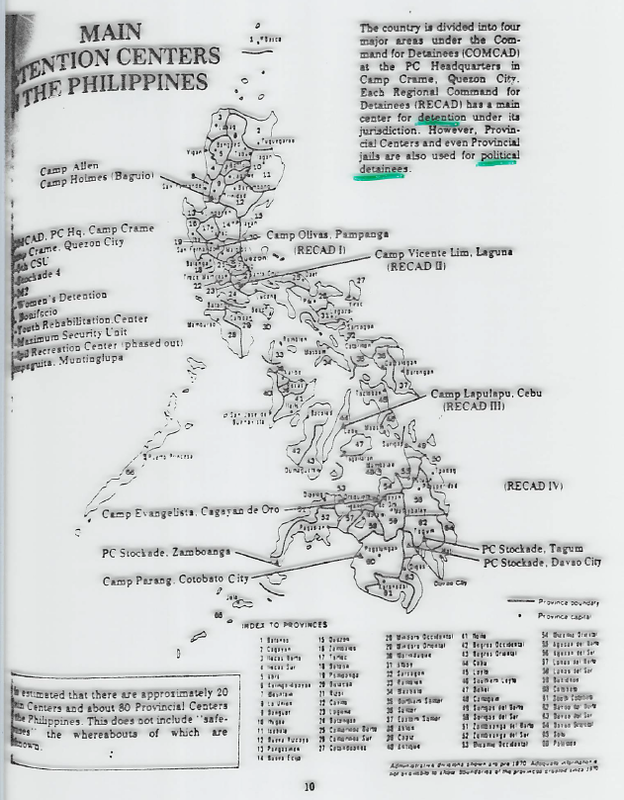 Camp Crane, Quezon City was where the Command for Detainees (COMCAD) was located. RECAD stands for the various Regional Command for Detainees (RECAD) that coordinate groups of detention centers throughout different parts of the archipelago. The next picture (fig. 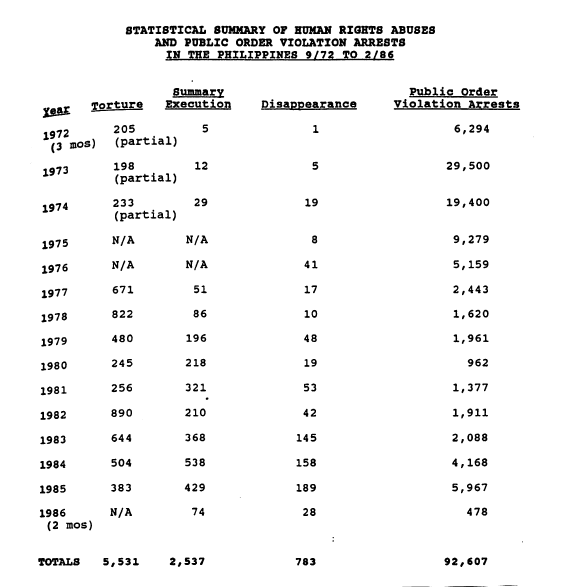 3) is of the Statistical Summary of Human Rights Abuses and Public Order Violation Arrests in the Philippines from September 1972 to February 1986. Please stay tuned for announcements on the public launching of the Jon Van Dyke papers which will take place in early 2018 at the William S. Richardson School of Law Library. There will be presentations on Jon Van Dyke’s papers, including more information on his role in this historic case “Estate of Ferdinand Marcos Human Rights Litigation.” At that time the collection will be made available for further research. 1Bello, Walden, David Kinley and others. Development Debacle: The World Bank in the Philippines. San Francisco: Institute for Food and Development Policy, 1982.